A group of us had a banding session at the regenerating bush patch next to the Houghton Bay School on Saturday afternoon. I had hoped to go there during the week to have some of the school kids take part but unfortunately the weather had other ideas. Hope to have another go this week but again the forecast doesn't look hopeful. On Saturday we caught 46 birds, almost all Silvereyes with the only others 1 Blackbird, 1 Song Thrush (first one for the site) and a Dunnock all new. The Song Thrush, aged as a 1 by the thorns on its coverts. Of the Silvereyes 38 were new and 5 were recaps, 2 banded in Houghton Bay about 1km south, 1 Mt Albert 1.5km north, 1 in the gully below my house 1km NE and only 1 from this site. We didn't band at this site last year due to damage done by the Southerly gales in late May early June. A feature of the day was the number of locals that joined us for periods while they were out walking in the area, and resulted in some very interesting discussions. One of our visitors holding a Silvereye ready for release. 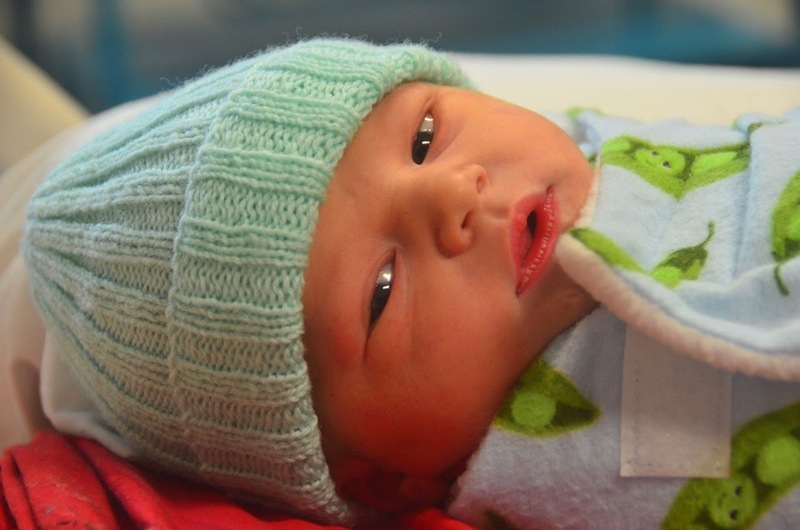 We have had very good news, Sarah and Kyle a couple of regular banders, have a little hatchling - a baby boy called Finn. Unfortunately due to bureaucracy he will be a Branta canadensis not a Apteryx australis. PS I have just received photos of the new arrival and parents, they all look well and he looks a little cracker. Over the last few days Silvereyes have begun to put in an appearance. I caught the first 6 last Friday with 3 new and 3 recaps. This morning I set the funnel trap and although the session was curtailed due to rain still managed to catch 31 with 14 new birds and 17 recaptures. There were 4 birds caught that were banded at the Mount Albert site, 3 banded this year and the other in 2012. The oldest bird caught was banded in July 2007. The only other species caught were 2 House Sparrows. The Silvereyes appear to be fewer in number than last year when the first significant catch of 64 was on 24 June. Last year numbers peaked in July when approximately 100 were caught in a day. We will wait and see what happens this year. Annette and I went back to the Zoo this morning and we were joined by Emma and Shannan from the Dept of Conservation. They are working on a video about mist netting and were hoping to get some footage of Tui catching and extraction. With this in mind we put a double net up under the large red flowered gum tree where large number of Tui are feeding. The Gum tree which has grown considerable since we last attempted to catch Tui under it. A net pole is visible on the right of the photo. Although there were probably 30-40 Tui in the tree we caught none which was both surprising and disappointing. This is the site where we caught up to 10 birds in a morning several years ago, I think the difference is that the tree has grown considerable in this time and the Tui stay in the upper canopy. The 2 colour banded Tui that were there yesterday were still present (the 3rd is at the other end of the Zoo), so are now recorded as a day older. The "Old Bird" with all bands still looking good. 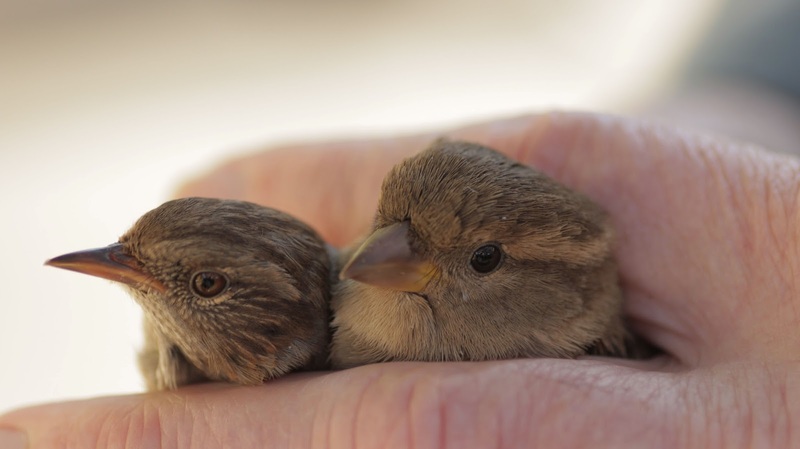 A Dunnock and female House Sparrow, often confused by many people. Today we recaptured an old Silvereye that had been banded in Jan 2008, so is of a reasonable age. This was in contrast to yesterday when no old birds were caught. Despite a cold southerly blowing we had fairly good conditions for mist netting at the Zoo today. There was a good turn out of banders but a lower number of birds were caught than is usual for June. We caught 55 birds of 7 species with 33 new and 22 recaptures. Last June the day's total was 191 and in 2012 it was 149. The reduction is mainly due to far fewer Silvereyes today, probably caused by the mild weather and the abundance of berries this Autumn. In contrast to last month when 3 birds over 5 years were recaptured this month no old birds were caught, but we did see 3 old colour banded Tui. Two of the male Blackbirds gave a good contrast between a 1st year bird (top) and an older individual. Chaffinch - 1 (1) the last 2 birds caught for the day. Kate all concentration removing a House Sparrow from a net. Tui - 0 (1) as well 3 colour banded Tui were sighted. W/M-W/Y banded at the Zoo 1 June 2006, 2933 days ago. Y/M-W/R banded at the Zoo 4 Sept 2004, 3578 days ago. This bird is the oldest Tui we have banded at the Zoo. 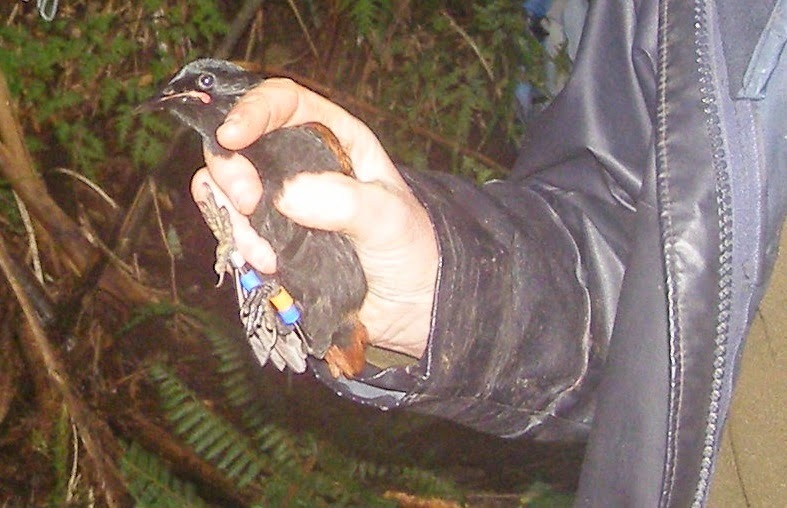 The Group has only one older Tui, a Karori bird last seen (and photographed) 3797 days after it was banded. We had mostly good conditions at our Island Bay Site this morning except it was a bit cold on the fingers as we put the nets up as well as for the next couple of hours. This was alleviated then by tasty snacks and a hot drink that we could warm our hands around. There was a good turn out of banders with Annette, Roisin, Ross with daughter Kate and Rory with his Uncle Josh. A month ago we caught over one hundred birds but today we just made the half with a total of 51. As was the case last month the majority were House Sparrows with 40 new and 6 recaps, other species were Blackbird 1, Dunnock 1 Silvereye 1 all new birds and 1 new Chaffinch and 1 recap. There were no old birds among the recaps with the Chaffinch and 1 Sparrow banded 2 years ago being the oldest. 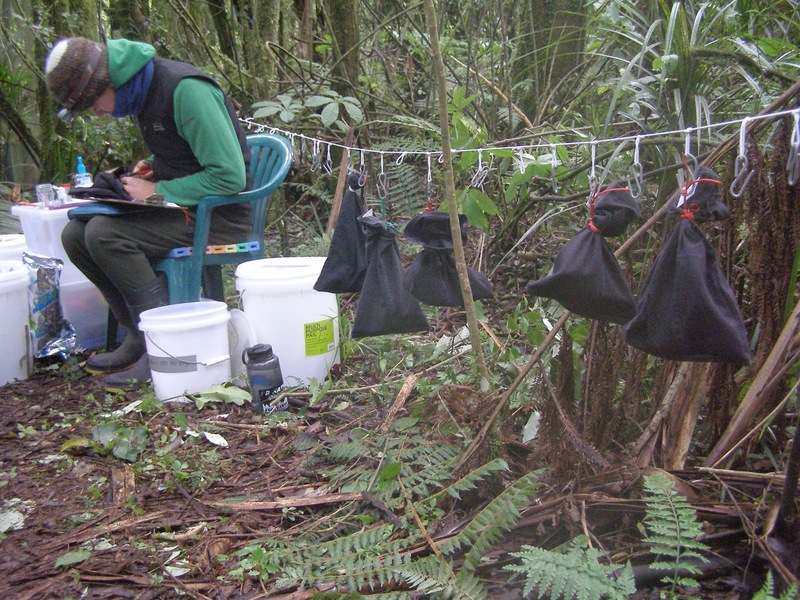 Annette, a long time and very active member of our group helped with a recent transfer of 40 Saddleback (Tieke) from Bushy Park Sanctuary to Rotokare Scenic Reserve. Annette has filed this report. Bushy Park Sanctuary is 100 hectares of fenced, predator free, original lowland rainforest about 25km west of Whanganui. Complementing the magnificent rainforest (which contains Ratanui, known as the largest living N I rata) are healthy populations of a variety of native birds. Saddlebacks and robins are particularly conspicuous, which is exciting since both populations have grown from relatively recent translocations. The first day of catching started with a heavy frost and was very cold. Saddleback are usually caught in mist nets and attracted using playback of recorded calls. That morning most of them were more interested in feeding than in responding to unusual disturbances, so we caught just 15 between 9am and 2pm. However after that things livened up and 20 more were caught in about half an hour. Kevin P processing a bird while others wait in line on a line. 5 more were easily caught the next morning, and we had our quota in record time, with a few juveniles and an even mix of sexes. A juvenile bird complete with bling. The birds were kept in an aviary where they soon keyed into their new diet and feasted on thousands of mealworms and pecked at juicy oranges. Many other fruits and food were available but these were their favourites. Four days later most of them had gained weight and they were caught and put in transfer boxes and driven to Rotokare. Rotokare Scenic Reserve is a 230 hectare forested hill-country catchment with extensive wetlands and a 17.8 hectare natural lake.A Trust was formed in 2004 and in an ambitious community-owned and community-driven project the reserve was surrounded by a pest proof fence and the pests within eradicated. Now they are starting to reintroduce missing species. Both Whitehead and Saddleback have now been introduced this year. It is a free access, open Sanctuary and boating is allowed. I was joined by Felix, and Rory and his Dad, at the Houghton Bay stream this afternoon. I was expecting a couple of others but I gather a flat tire prevented their arrival. Despite my dire predictions of only a small catch we managed to get 27 birds of 6 species with 23 new and 4 recaptures. Rory with a Fantail closely watched by his Dad and Felix. Blackbird - 2 (1) the recap was banded Feb 2010 and is now the oldest Blackbird recaptured at this site. Felix about to release one of the Blackbirds. Chaffinch - 4 (1) the recap was banded at the Zoo back in February. The four youngsters about to release Silvereyes. Three gone and one about to go.